Unlike, say, 97 percent of TV news shooters, I LIKE newspaper photographers. Why wouldn't I? They're hardworking, resourceful interlopers with a seriously creative bent. So what if they worm their way into your frame, gum up the scrum, then skulk away with the shot of the day? That doesn't mean we can't be friends! Yet ... so many of us aren't. It's silly, really. Denizens of print have long held our ilk in low esteem - and not just those nerds with the narrow notebooks. Many a still photog has arrived on scene early, blended in despite their many lenses and waited patiently ... only to have some dimpled bimbo and her one man entourage roll up late, loud and -GASP!- logoed. Can you blame them for rolling their eyes? Sure, but you really shouldn't. Not with the coming camerapocalypse - that earth shattering upheaval that's gonna level the playing field for lenslingers of every breed. Hell, it's happening already. 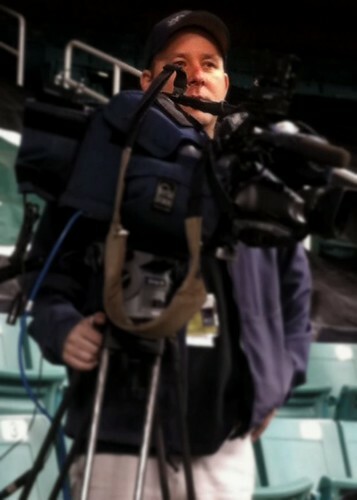 News shooters wrestling with their cell phones, snappers juggling microphones ... what's next? TV reporters paying attention? (Ooh, sorry. Wrong rant.) Anyhoo, take my unwanted advice and find a way to get along with that still photographer. If you're lucky, you'll both be working for the same robot consortium some day. Me - I like to turn the table on my newspaper friends. Whenever they're not looking, I whip out my Droid and take a snapshot of them. That's how I got this delightful frame of my buddy Nelson here. 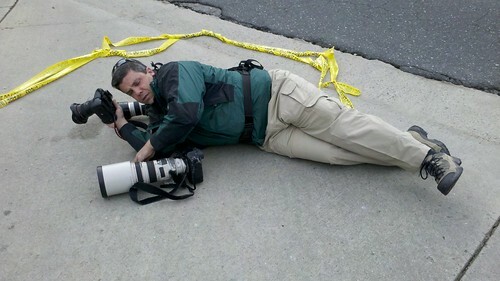 Leave it to him to get all ground-level at a grimy crime scene all for a better shot. I respect that - if only because your average TV photog wouldn't get that low unless some catering truck jack-knifed and splayed free Jell-o shots across the open highway. Once upon a time, sharing courtroom video took little more than a gentleman's agreement and the toss of a tape (or two). No more. It's rare these days for any two stations within the same market to record video on the same format, let alone ALL of them. So when some judge stops brushing crumbs off his robe long enough to decide he can abide but ONE camera in his courtroom, a delicate, digital dance begins. Except it ain't so delicate. Not with a handful of fully grown A/V geeks scrambling around bug-splattered news wagons. Pop quiz, Hotshot. Your biggest competitor's got hot footage of the star witness blowing her nose under cross examination. He'll share it with you, too - but only if you make it easy on him. Too bad his station records images on used solar panels, while your employer prefers computer cards the size of postage stamps. Hey, did I mention everyone's boss is screaming into their headsets for you vested oafs to figure it and feed the video NOW so that said Star Witness can wrinkle her Kleenex on the promo leading into Dr. Oz? Well, they are, so you'd better daisy chain those cameras together and pray in the name of Saint MacGyver that Missus Witness pops up on that one inch screen. But don't think all your energy's going to waste. Somewhere in a courthouse window, a judge is chewing a toothpick and humming a familiar tune as he watches blue-collar Joe's do the Hokey-Pokey. Besides, all the really important people took out restraining orders.